We all have problems in life that crop up from time to time. Some have more problems than others but it is guaranteed that there will be problems at some time in your life. 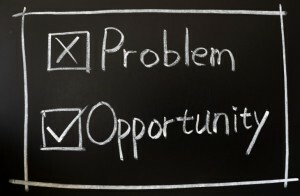 It is strictly up to you to decide whether everything in your life is a problem or whether everything is an opportunity. I know some of you are probably thinking that this is either seeing the glass half-empty or half-full. I would like you to expand your thinking and think outside the glass instead. Why don’t we say the glass is successfully half attempted or half opportunity waiting to overflow. In fact, why should we stop at the top of the glass at all? I really don’t see a reason to stop at the top do you? Have you ever thought to yourself or said to yourself that, “everything would be just fine if I didn’t have to deal with these problems.” I am sure you’ve heard of that before or of even said something to yourself very similar before. We probably all of said something like this at one time or another. If they don’t have many problems, then they are probably not taking many chances or risks. If they have big problems, they’re probably taking big chances and risks and are trying to make a difference not only in their lives but probably in the lives of people around them as well. For the most part, people believe that having problems and difficulties in their life is a bad thing. This is a massive misconception and also a complete lie. I believe that anyone can be happy, optimistic and joyful as long as everything is going along just fine. If you want to see who someone really is, and what their true mindset is, then watch them when their life isn’t going according to plan. Watch them when life will throw them some curveballs and a few issues and situations they’ve got to figure out a way through. Everyone has problems in their life to some degree, everyone. You may find this hard to believe but for some crazy reason, every single problem is usually presented with a solution within it. You just have to look a little closer and dig a little deeper and maybe take a look at the problem from a different angle or perspective and boom—there it is— the solution is right under your nose. I would like to give you a real life problem that completely offered an unlikely solution. One of the key figures in organizing and building of Mother Teresa’s sisters of Charity, Father Angelo Scolozzi, had a big problem. He was looking for a motivated individual with very specific qualifications to help set up a program in Italy for recovering drug addicts. Just about the same time Dr. Lou Tartaglia was working on a book of success stories in America. This book was about people who became very successful in their field. He decided that he would like to interview the most successful nun he knew and that was Mother Teresa. He sat down with her and in his initial conversation found her to be a very pleasant and tiny woman. She teased him about the true meaning of success. As they were talking, father Angelo had arrived to meet with Mother Teresa. He was explaining to Mother Teresa that he was finding it extremely difficult finding a psychotherapist specialized in addiction and that also spoke fluent Italian. Dr. Tartaglia overheard this and soon realized why he was there. He was there as a solution to their problem. He was that psychotherapist that they were looking for and he specialized in addiction and he spoke fluent Italian. They spent more than a decade working together and easing the suffering of many all over the world. So what is the point in this? Problems are going to come and problems are going to go and your life is not going to be perfect every single day. You can have the most positive mindset and problems are going to crop up now then. That is reality and it is a fact and there’s nothing you can do to change that. What I want you to get here is that problems are not the problem. These are just situations that are presented to you at different times. When presented with these problems you have two choices; you can see them as being destructive spirit breaking roadblocks in your life or you can see them as constructive, mind expanding opportunities that will help you problem solve and move forward to success. It is just that simple. Encountering difficulties is just a part of life. Instead of saying why me, count yourself lucky as you have been chosen to seek out and learn a valuable lesson instead. Remember: the only people who don’t have problems are dead people. So here is the action step for this week. I would like you to take a look at your life and ask yourself what do you consider to be problems. Write down what are the problems that you worry about on a daily basis? Take out a journal or notebook and something to write with. Sit down and close your eyes and write them all down. We are talking about the present and not the future as that will come soon enough. So do you consider a problem your health? Your physical appearance or a money issue? Is it the fear of failure or fear of success? Write down what it is that you worry about on a daily basis. Now take a look at the problems that you have written down. These are the exact things that you have allowed to have power over you. These things have pulled the wool over your eyes and it has led you to believe that this is where you have to stop thinking because these problems are the end for you. No, the teacher said, “here are some problems to solve and they all have answers now go solve them.” That was the meaning behind why the homework was given. This is what I would like you to do as well. I would like you to take your list and write one problem at the top of the sheet of paper. You will do this for everything you have written but one at a time. Under each problem I want you to write another title and header: that title is Solutions. Now here is where the real fun starts. Yes think of this as being fun and it’s going to be fun! Remember, I want you to think outside the glass. I would like you to come up with a new, creative, crazy and totally off-the-wall solution for each problem. I really don’t care how impossible you believe your solutions are I just want you to write them down. Think of it this way, crazy solutions are genius in disguise. Try and write out 20 solutions for each problem. 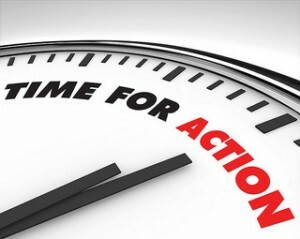 Then, break each solution down into action steps, then once you’ve done that, decide which solution you are capable of doing right now, and I mean right this very minute. Then take action and do it. Then do each action step until you have completed that solution. Then if your problem is still there just try another solution. Just keep going until you discover the one that will solve your problem. I know this may seem like a lot of work to some people but I want you to remember Thomas Edison. Someone asked Edison what he had to say about the fact that he had failed thousands of times while he was trying to perfect and create the light bulb. I love Edison’s answer. His answer was, “I never failed I simply had to run through enough learning experiences to find a way that worked.